Australia’s 2018 budget comes on the back of positive economic forecasts - what are the important details for businesses? The Australian Federal Budget for 2018-19 was handed down on 8 May 2018. After a higher than expected growth rate of 4.25% (given a forecast of 3.5%), the budget seeks to distribute a $26 billion windfall - in the form of expenditure programs and a range of tax adjustments. $200 offset for taxable incomes up to $37,000. Up to $530 offset for taxable incomes between $37,000 and $48,000 - starting at $200 and increasing three cents per dollar to $530. $530 offset for taxable incomes between $48,000 and $90,000. The offset applies to incomes between $90,000 and $125,333 - but phases out at a rate of 1.5 cents per dollar. Offsets are not refundable and are determined when employees lodge tax returns. Tax brackets: The budget proposes to adjust and simplify existing PAYG tax brackets, by extending the 32.5% rate as a flat tax for incomes between $41,000 and $200,000. The changes come into effect from 1 July 2018, through to 1 July 2024. The 19% tax rate limit will increase from $37,000 to $41,000 from 1 July 2022. The 32.5% tax rate limit will increase from $87,000 to $90,000 from 1 July 2018, to $120,000 from 1 July 2022, and to $200,000 from 1 July 2024. The 45% tax rate limit (the highest rate) will increase from $180,000 to (income exceeding) $200,000 from 1 July 2024. Medicare Levy: A proposed 0.5% increase in the Medicare Levy for 1 July 2018 will not be enforced. Higher Education Loan Repayments: Effective 1 July 2018, the threshold for the repayment of student loans will be lowered - from $51,957 to $42,000. Minimum wage review: Effective 1 June 2018, Australia’s minimum wage increased by 3.5%. The national minimum now stands at $719.20 per week ($18.30 per hour). Superannuation: The cap for concessional superannuation contributions remains set at $25,000 for 2018-2019. The cap for non-concessional contributions however, is raised from $180,000 to $100,000. The government announced that the Superannuation Guarantee Charge (SGC) will be increased to 12% by 2025-26. The maximum super contributions base for a given income year has been raised to $54,030 (from $52,760) for 2018-19. The cap amounts for both life benefit termination, and death benefit termination payments have been raised to $205,000 (from $200,000). The base limit for genuine redundancy and early retirement scheme payments has risen to a $10,399 (from $10,155) - while the limit for payments for each completed year of service has risen to $5,200 (from $5,078). 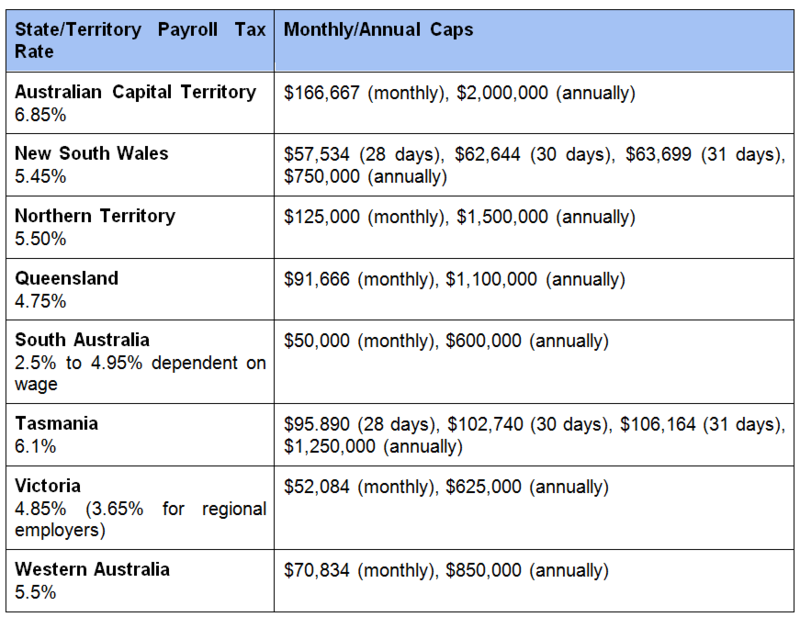 For more information about Australia’s tax and payroll landscape, browse activpayroll's Australia Global Insight Guide.